We have a good selection of demo wheels at the shop. Come in and take them for a spin! We offer competitive pricing. 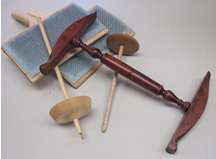 A complimentary spinning lesson or a bag of roving is included with all wheels. First, pick through your fleece and get rid of the really dirty parts. Fill up a deep sink with very hot water. Put in 2-3 tablespoons of Orvis paste or a couple of squirts of Dawn dishwashing detergent and swish it around. Don't let it get too many suds. Add your fleece, push it under the water, put a plastic garbage bag on top to hold in the heat and let it sit undisturbed for a half hour. Put the wet fleece in something to drain (one of those black plastic plant holders from the garden shop is good) and then drain the water. Fill the sink up again with water the same temperature, add a "glug" of white vinegar (to cut the grease), put the fleece back in and cover it. Let the fleece sit in the sink for 20 minutes this time. Repeat this rinse, without the vinegar, twice more for a total of 3 times. Take out the fleece, drain it, and let it dry. I use an old screen and put the fleece on that, either on the bathtub or outside in the sun. Cut a piece of strong cotton crochet string (or rug warp) about 3 feet long. Make a loop and tie the ends together with a square knot. Put this around your bobbin and slip one end through the other. Then do it again to keep it from slipping on the bobbin. By making this type of leader, you'll be able to slip in a piece of roving or a rolag, fold it back on itself, let the twist hold it together, and start spinning. Easy!! !